Singapore is constantly the marvel of travellers who love the pockets of green spaces; rain trees line every street and bougainvillea creep along pedestrian bridges. Committed to his vision of a city in a garden, Lee Kuan Yew initiated a Tree Planting Day in 1963, and the yearly affair continues even today. But there’s a lot more to being a truly green city than this alone. In 2015, Vermont, Burlington in the United States started running entirely on renewable energy from solar, wind, hydroelectric and biomass sources. Other cities, such as Copenhagen, aim to reduce carbon emissions from vehicles by promoting cycling. Even Hong Kong cracked down on the mass disposal of waste by introducing a plastic bag levy several years ago. 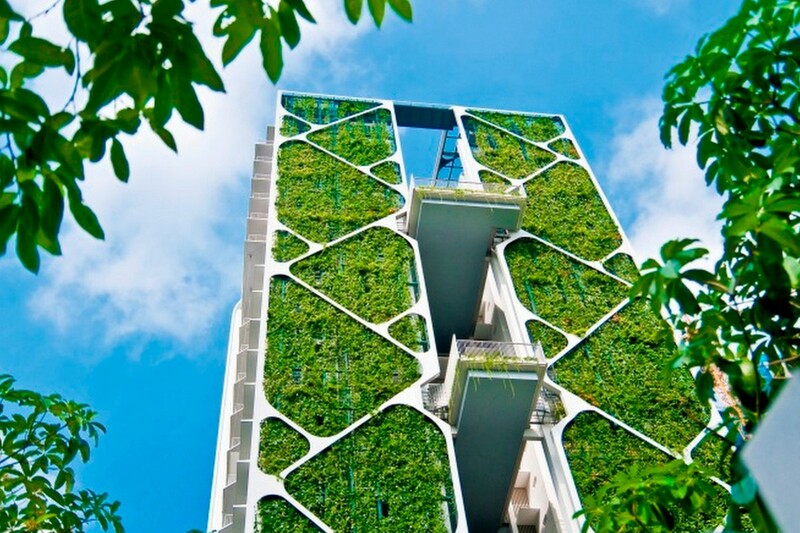 Thankfully, Singapore has also upped its green game in the past few years, with a rise in eco-friendly developments. Featuring exemplary designs with a focus on environmental sustainability, this cause is slowly but surely gaining traction here. We take a look at 5 of these buildings from residential, commercial and even education developments. CapitaGreen brings a breath of fresh air to the clutter of concrete and steel in the Tanjong Pagar business district. 55 percent of the building’s exterior is covered with lush foliage, putting office workers in close touch with nature throughout the day. Meanwhile, the rest of the façade boasts double-skin glass that reduces solar heat gain and keeps the interior cool. 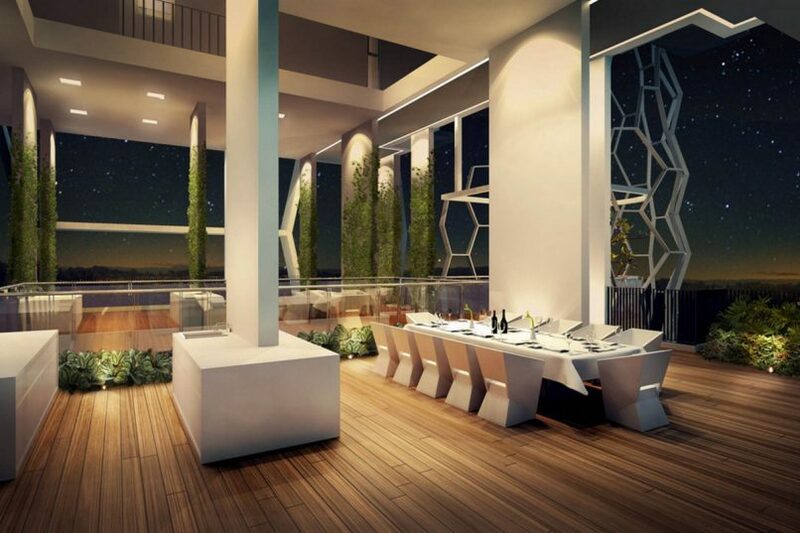 The highlight is the sky forest on the rooftop of this 242 metre tall building. 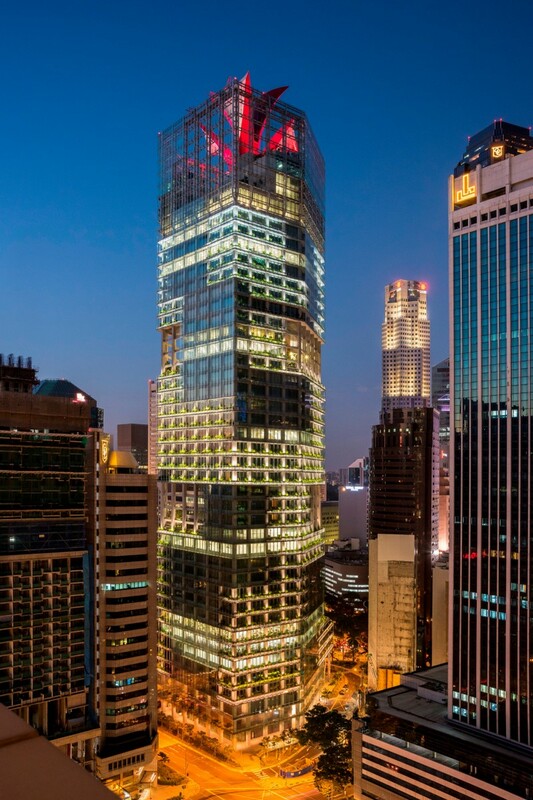 It channels fresh, cool air through its core channels, providing air-conditioning to all 40 storeys at a vastly reduced rate of energy consumption. It’s also equipped with a rainwater harvesting system to self-irrigate the vertical garden. And to top it all, it houses a Mediterranean restaurant, Artemis, which uses sustainably-sourced ingredients from eco-conscious farms. Tree House set a Guinness World Record for being the world’s largest vertical garden. Upon completion in 2014, this Singapore condominium set a Guinness World Record for being the world’s largest vertical garden. Its four towers, each 24 storeys high, are encased in lush foliage that filter pollutants and carbon dioxide out of the air to reduce the residential estate’s carbon footprint. While the green wall removes greenhouse gas emissions to minimise heat absorption, state-of-the-art windows make use of heat-reducing technology, keeping homes cool throughout the day. Located within a forest canopy between Bukit Timah Nature Reserve and Upper Pierce Reservoir, the property further blends in to its surrounds with green sky terraces on various floors. It also has a sloped design to maximise the harvest of rainwater, which is then channelled to a self-sustaining irrigation system for the landscape. Eco-friendly functionality needn’t come at the cost of stylish design. 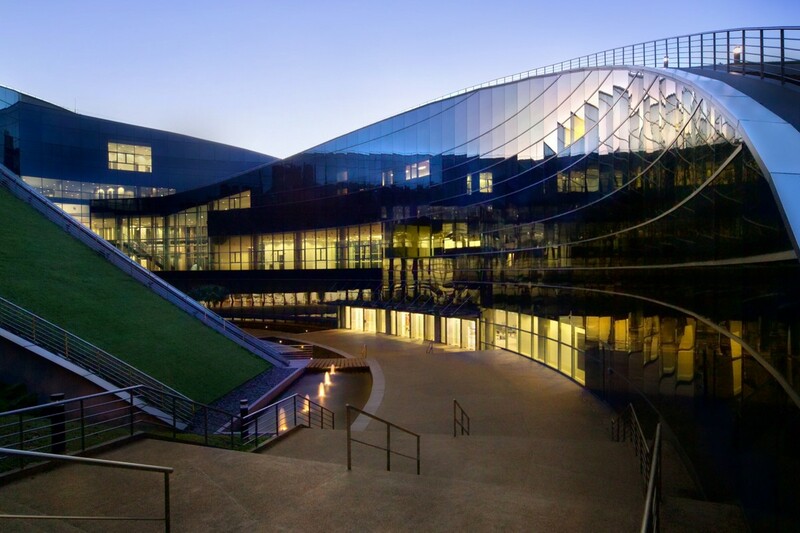 Nanyang Technological University’s ultimate aim is to be the most eco-friendly campus in the world by maximising resource efficiency and minimising waste, energy and water usage. Its School of Art, Design and Media is making art from sustainable buildings with a dramatic sloping roof over three interweaving blocks. Covered in turf, it seamlessly connects to the ground’s contour, allowing easy access to the outdoor communal space. Not just for aesthetic appeal, the green roof and high performance glass façade maintain a low ambient temperature, while the reflective pond keeps the central courtyard cool. Lights with built-in motion and photo-cell sensors also help to reduce energy wastage, while retrofitted air-conditioning systems are equipped with carbon dioxide sensors to improve air quality indoors. This vividly coloured building stands out from the rest of the concrete jungle in the Central Business District. 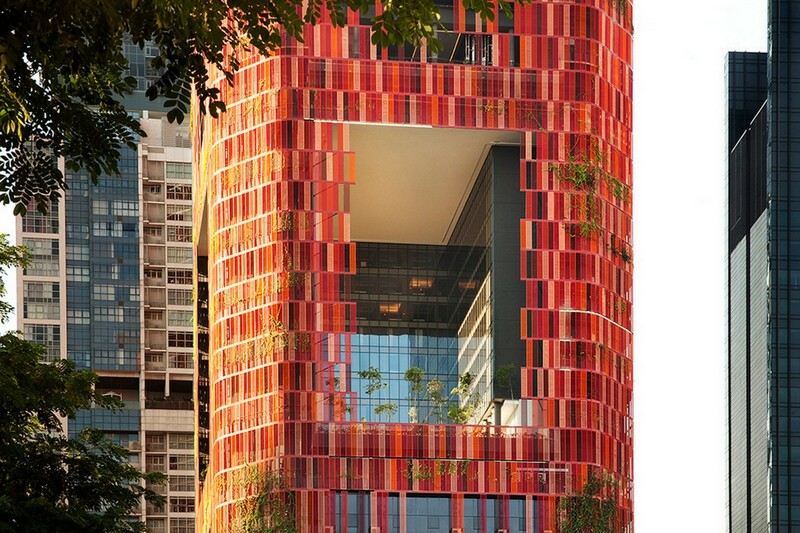 Adding a splash of green (and red) to the cityscape, Oasia Hotel puts a refreshing take on commercial high-rise developments with its tropical, verdant tower. Committed to providing green solutions to urban landscapes, it is making an impact with an architectural design that goes beyond rooftop gardens. Its red vertical grid is encased in a green skin, with creepers and flowering plants entwining themselves around each panel. 30-metre tall sky gardens break up the distinct strata of Soho, Hotel and Club rooms, and allow cross-ventilation across the atria. They also help to soften the view of the urban fabric for office workers in the building. And with the sheer amount of garden space incorporated, the development boasts an impressive green plot ratio of 750 percent. Dine in tranquility at Eco Sanctuary’s outdoor pavilion. Recently completed and in the process of getting ready for its Temporary Occupation Permit, this new condominium is set to rival Tree House as a green residential space that also features rain water harvesting and automated irrigation. As its name suggests, it was created with a vision of enhancing the relationship between home and nature, and offers eco-living in the midst of sweeping natural surroundings. Following the theme of a butterfly’s metamorphosis from the egg to chrysalis and papillon stages, Eco Sanctuary houses butterflies of various indigenous species within an ecosystem of shrubbery and flowering plants. Its architecture also captures the minutiae of a butterfly’s wings with an interlay of curvilinear and oblique patterns. While hexagonal shapes on its exterior provide shade from the sun, each unit is still designed to maximise natural lighting and ventilation.